BMW Motorrad India has started dispatching the BMW G 310 GS to dealerships across India. The company launched the BMW G 310R and the G 310 GS on 18 July, priced at INR 2.99 lakh and INR 3.49 lakh (ex-showroom Delhi) respectively. Tusker BMW Motorrad has released images of the BMW G 310 GS arriving at its yard on its Facebook page. 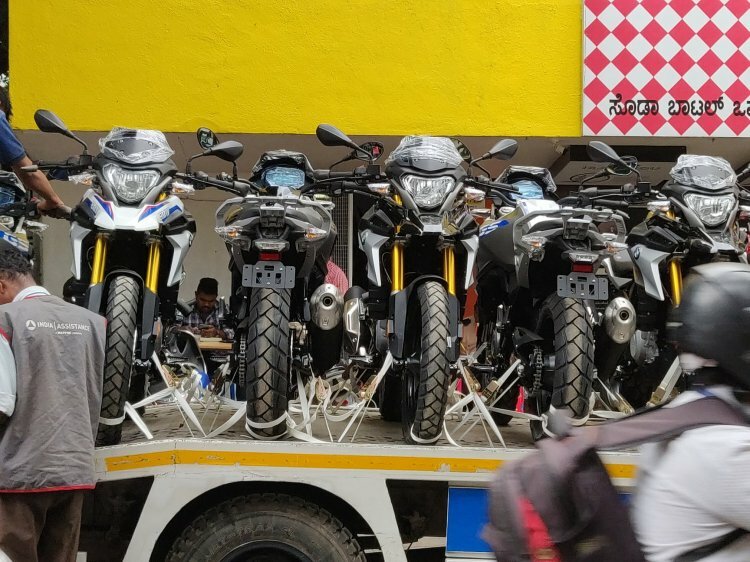 BMW Motorrad India’s authorized dealership – Tusker BMW Motorrad – has released images of receiving the first consignment of the BMW G 310 GS adventure tourer motorcycle. BMW dealerships across India are accepting bookings for the BMW G 310 twins at an amount of INR 50,000, while initial deliveries have already started in India according to BMW. The BMW G 310 GS rivals the Kawasaki Versys-X 300 and till some extent with the Royal Enfield Himalayan. That said, come 2019, and the G 310 GS will have a direct rival in the form of the upcoming KTM 390 adventure. BMW Motorrad India has received over 1,000 bookings for the G 310 twins, and the G 310 GS has acquired a big chunk of these bookings. Despite being an adventure tourer, BMW is yet to offer official accessories for it. 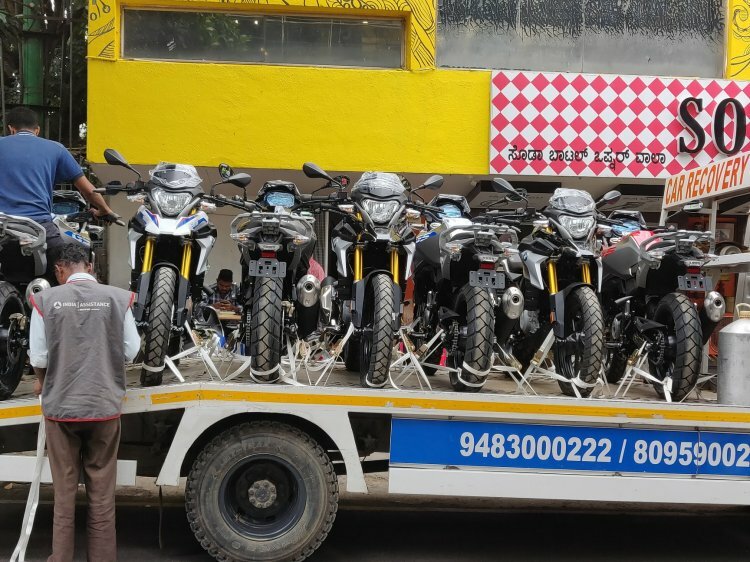 However, Nagpur-based accessories supplier, MotoUsher is offering aftermarket accessories for the BMW G 310 GS from brands like Wunderlich, Scottoiler, and Hepco Becker among others. That said, most of them are imported and expensive. The BMW G 310 GS employs a 313 cc, four-valve, DOHC, single cylinder engine with liquid cooling. The fuel injected motor is capable of producing a maximum power of 34 bhp at 9,500 rpm along with a peak torque of 28 Nm at 7,500 rpm. A 6-speed transmission relays control to the wheels. A tubular steel trellis frame uses the engine as a stressed member, while the rear sub-frame is bolted onto it. The BMW G 310 GS costs INR 3.49 lakh (ex-showroom Delhi), and rivals the Kawasaki Versys-X 300. Anchorage comes from a 300 mm front disc and a 240 mm rear disc setup, while the bike gets standard dual-channel ABS. Suspension components include 41 mm upside-down front forks and pre-load adjustable mono-shock at the rear, while the suspension travel stands at 180 mm at both the ends. The BMW G 310 GS features 19-inch front and 17-inch rear alloy wheels that run on 110-section front and 150-section rear Metzeler Tourance dual-sport tires. Essential features include a digital instrument cluster, rear luggage rack and LED taillights.